For many car enthusiasts the ‘Big Healey’, the Austin-Healey 3000, epitomises the British sports car – rugged good looks, powerful engine and macho handling. The story of the 3000 is a fascinating one but the story of the man behind the car is one of even more interest as Donald Healey was one of the great entrepreneurs who, if he hadn’t built cars, would have succeeded in any venture that required an eye for a market and inspired salesmanship. Donald Mitchell Healey, or DMH as he was, and still is, known was a Cornishman, born in 1898 in Perranporth. His father was a shopkeeper, a shop owner and latterly a builder and developer. His son became interested in all things mechanical at an early age, most particularly aircraft and after leaving school he joined Sopwith Aviation where he learned to use machine tools. The war came and DMH joined the RFC training as an air mechanic and learning to fly. He served on anti-Zeppelin patrols and also as an instructor. His flying career however came to an end in 1916 when a crash resulted in him being invalided out of the RFC. He returned to Cornwall and took a correspondence course in automobile engineering whilst experimenting in radio transmission, obtaining a licence to transmit radio signals prompting a successful foray into the design of radio receivers – the Perraphone. Having put his first love, aviation, to one side he turned to his second – automotive engineering and opened a garage in Perranporth, financed by his father. In the early post-war years cars were few and far between and DMH supplemented the income from the garage by running a charabanc and hire car service. This business prospered and the young DMH was able to indulge his interest in motor sport buying an ABC with a horizontally opposed, air cooled flat twin engine. This car is reported to have had a dummy radiator that contained the fuel! He participated in many hill climbs and trials including one from Land’s End to John O’Groats, this in 1922 when roads were no more than tracks and cars were crude, unreliable and only for the hardy being almost exclusively open tourers. Through motor sport Donald met and often developed a lasting friendship with the motoring names of the day- the Riley brothers, Cecil Kimber who was to start MG – amongst others. He was becoming quite successful in rallies and trials and in 1929 entered the Monte Carlo rally in a little Triumph Super Seven family saloon. The car was late at the finish and was excluded but the bug had bitten. He entered the following year and came seventh overall. He was getting himself noticed and forging links that would ultimately result in the production of sports cars admired the world over. In 1930 he was approached by Noel Macklin (later Sir Noel) to drive an Invicta in long-distance competitions to publicise the marque. The combination was an instant success culminating in a win in the Monte in 1931 despite having damaged a linkage en-route that resulted in three-wheeled braking! Donald continued to rub shoulders with celebrities, motorsport attracting the wealthy and influential in the pre-war period. One such was Ian Fleming, creator of James Bond, who navigated for DMH on one occasion, admittedly at the time he was a hack at Associated Press and had been sent to report on the event! The event was successful in that the team won a flight in the Graf Zeppelin for success in the Glacier Cup, a competition within a competition on the Alpine Trial. 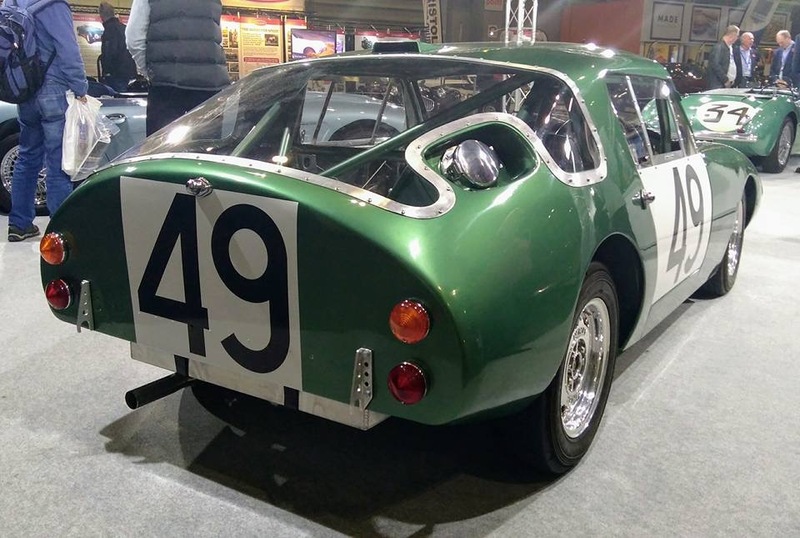 DMH had aspirations beyond Invicta, however and through his contact with the Riley family was loaned a Riley Brooklands, which he campaigned successfully in the Alpine Rally, which lead to a short spell assisting the company in vehicle preparation. In those days success in an international rally or at a premier road race such as Le-Mans was front-page news and a guarantee of increased sales for the successful marque. DMH’s reputation was high and he was approached by the Triumph Motor Company, in those days manufacturers of sporting cars to compete with the likes of Riley and Alfa Romeo. He had sold his small motor business and so when he was offered the job of Experimental Manager he had no reservations about leaving Cornwall to move to Warwickshire. Throughout his period with Triumph he continued to compete, and win rallies, but he had an aspiration to design a British sports car to compete, and beat continental opposition most particularly the all-conquering Alfas, of which the Monza 2.3 litre supercharged straight eight was the most famous. It has often been said, with great scorn, that the Japanese motor industry grew from copying European engineering and indeed it could be argued that this was the case but it has always been so. DMH and Triumph, rather than taking a clean sheet of paper and developing their own design from scratch decided to take the short-cut of stripping down a Monza engine, measuring each part and building an engine almost identical in every respect. The result was the magnificent 1934 Triumph Dolomite, a sleek two-seater with an enormously long bonnet sheathing the straight eight engine, with chromed exposed exhaust snaking along the nearside of the car. Donald decided to take the car on the 1934 Monte to prove the design and all was well until a coming together on a railway crossing with a train! DMH and navigator were unhurt but the car was a right-off. Only 3 Dolomites were built as the market was limited and the price more than a 3 litre Bentley, but Donald stayed at Triumphs for 5 years until the War, when the company went into liquidation. He stayed on at the factory for some time, however, manufacturing carburettors for aero-engines and serving in the RAFVR as part-time officer in the ATC, moving towards the end of the war to Humber on the fighting vehicle side. At Humber the germ of an idea began to grow within DMH’s mind, the idea that once the War was over he would build high-performance cars of his own. In July 1945 Donald Healey wrote an article entitled ‘The Enthusiast’s Car’ which outlined his ideals for a car to compete with the pre war continental masterpieces exemplified by the Mercedes SSK and 2900cc 8 cylinder Alfa Romeo – Donald Healey’s perfect car. The article was a semi-technical treatise covering wind resistance, power to weight ratios, rolling resistance and engine design. It was the specification for his own first cars, a specification designed to shake off what he considered to be the English image as a manufacturer of ‘fast lorries’. DMH joined forces at the end of the war with colleagues from Humber where he worked his war years, they moonlighting with this mercurial character with a dream of a roadster to directly compete with the pre-war 2-litre BMW 328, ‘By far’, he says in his autobiography, ‘the best small sports car of its time’. Unlike Bristol who were able by fair means or foul to ‘liberate’ the design of the BMW engine that powered that car he had to obtain an engine, by no means easy in the immediate post-war climate of shortage and general austerity. He used his extensive personal network, however, and Victor Riley agreed to supply units of his very advanced 2.4 litre four cylinder engine, developed from the engine that powered the ‘White Riley’ of Raymond Mays and cousin of the engines that became world famous as the powerplants of the ERAs. This engine developed 100 bhp, which was the minimum DMH considered necessary, this was to be a sports car, after all! The team struggled against shortage of materials but persevered and produced a chassis and suspension unit incorporating trailing links, unusual and advanced for the day, with a roadster body panelled by Westland Engineering of Hereford. In parallel a saloon was developed with a closed body by a firm of shop fitters, Elliots of Reading. The new car was shown to an enthusiastic press in January 1946, orders were taken, premises obtained in Warwick close to the heart of motor manufacture in England – the Donald Healy Motor Company had been born! The cars were fearsomely expensive, however, competing with Armstrong Siddeleys and Aston Martins and DMH, always with an eye to a market, designed and built the Silverstone sports model which sold for under £1000 without purchase tax, still a not inconsequential sum in 1949. These cars had the same chassis and engine and soon became the car of choice amongst the knowledgeable sporting gentleman because of their power and handling. The name Healey was becoming known for quality sporting saloons and roadsters with chassis offered un-bodied as was common with Bentley and Rolls-Royce to customers for coachwork by Tickford, Abbots of Farnham or Duncan Industries of North Walsham amongst others. The business was going well but success to Donald was in volume manufacture and he set off for the States in December 1949 on an export or die visit to further promote the marque across the Atlantic. A chance encounter on the Queen Mary with the president of the Nash Kelvinator Corporation resulted in a commission, funded by Nash, to develop a sporting car for the US market based on the Healey chassis but with Nash’s 3.8 litre six-cylinder engine. This Donald in his inimitable style did in double quick time and the Nash-Healey was born – for export only. DMH admits that this deal was the turning point for his company, enabling him to develop the car that would be known as the Healey Hundred or, following the motor show of 1952, the Austin-Healey. Through his many visits to North America he had identified a market for a sports car to fill the gap between the XK Jaguars and the near-obsolete MG T series and so he started work on a prototype in secret at his home to avoid problems with Nash, with whom he was planning to become a competitor, or Morris, from whom he obtained Riley engines at that time. He had discussions with Leonard Lord, head of Austin Motors who agreed to supply A90 engines and transmissions for the new car. DMH was happy with the 2.6 litre 4-cylinder engine but not so with the gearbox and modified it to a three-speed unit blanking off the low first gear fitting an overdrive working on second and top effectively giving a five-speed ‘box. The result was a stunning two-seat sports car, the Healey Hundred, the designation referring to 100 horsepower and to the 100mph+ that it achieved in road tests. The target was to announce the new car at the London Motor Show and legend has it that DMH although regarding the car as a ‘winner’ was unhappy with the front grille, an elongated version of the by now familiar Healey shield, such that he insisted that the car was shown with its front up against the wall at the back of the stand. Again in his autobiography DMH says of its reception ‘From the moment the show opened it was a sensation – we didn’t know how to keep people away from it’. The effect on the leaders of the main motoring manufacturers was equally dramatic with approaches from two ‘majors’ with offers of co-operation. DMH explained that the car had been developed in conjunction with Austin and there was no possibility of anyone else becoming associated with car. Leonard Lord was delighted with the car and its effect on the public such that he proposed a deal to DMH whereby Austin took over manufacture paying DMH a royalty. The logic being that whereas Healey could produce 20 cars a week at best Austin could produce 200 at a price £100 below DMH’s anticipated selling price. Overnight the car became the Austin-Healey Hundred with badging to match and turned its face to the admiring crowd. Thus began a sixteen-year relationship with Austin, BMC and for a short spell British Leyland before the final model rolled off the production line in 1968 Ralph Nader sealing its fate in the mid-sixties with the introduction of side-impact crash tests and emissions laws in the Healey’s main market, the US. By that time the car had entered motoring history. First as the 100M incorporating modifications that had been adopted on cars entering the famous Le Mans 24-hour race, the 100S ‘Sebring’ model raced by Stirling Moss and Lance Macklin, the latter being involved in the terrible crash at Le Mans in 1955 when a Mercedes catapulted over the rear of the 100S to scythe through the crowd killing over 50 spectators. In 1956 the six-cylinder 100/6 was introduced to be rapidly followed by the model that became every schoolboy’s image of the fire-breathing rally car, the 3000. Success in competition followed success. DMH generated much publicity when he took a 100 and later a 100/6 to Bonneville Salt Flats where he topped 200mph in a specially prepared car in 1956. The BMC teams of 3000s managed by Marcus Chambers and Peter Browning carried all before them in rally after rally including the Monte Carlo, the Alpine, Liege-Rome-Liege and many others driven by the kings of the sport – the Morley Brothers, Jack Sears, Pat Moss, John Gott, Paddy Hopkirk, Timo Makinen and the rallying reverend, Rupert Jones. The Americans could not get enough of the cars despite the low ground clearance and cockpit heat, which, as any passenger will tell you, can be unbearable. Not one to rest on his laurels in 1958 DMH designed a small sports car around A30 mechanicals the Sprite, known fondly as the ‘frog-eye’ due to its protruding eyeball-like headlamps and dabbled in ski-boats, the Healey Sportsboat powered by an MGA engine. When his contract with Leyland was terminated he was courted by many manufacturers one of whom was the new owner of Jensen and the much-maligned Jensen-Healey powered by Lotus (lots of trouble, usually serious!!) was introduced in 1972 as a result. DMH had, however, broken his own golden rule of using well-proven mechanicals and the car achieved a reputation for unreliability despite more than adequate performance when on-song. 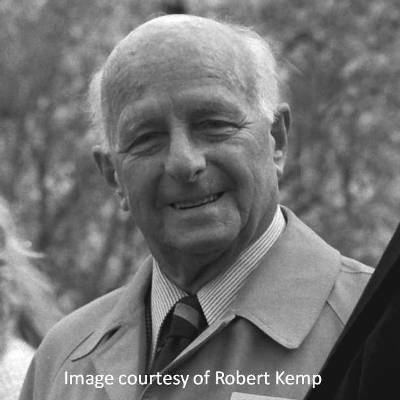 He was given a CBE in 1973, which was regarded as long-overdue recognition of his contribution to the automobile industry over a long and very fruitful life. From 1963 DMH had a house back in Cornwall initially at Trebah, famous for its sub-tropical garden (and DMH memorial) and he continued to travel extensively all over the world until the end of his life but particularly to the States keeping in touch with racing friends and with the clubs that keep the legend alive even today. Moving out of mainstream business he established Healey Automobile Consultants with his son Geoffrey who had worked alongside him during the development of the Healey models. Not one to retire he kept his hand in developing ideas such as a wind generator tested on the top of a mini! Donald Healey, pilot, rally driver, record breaker, car manufacturer and legend to motoring enthusiasts the world over died in his native Cornwall on 15 January 1988, a few months before his 90th birthday. The funeral was held in the small Methodist Chapel in Perranporth and the cortege included representatives of his life’s work, the cars that bear his name. For more about Donald Healey read ‘ My World of Cars’ Donald Healey’s autobiography in conjunction with Peter Garnier and completed by his younger son Brian published by Patrick Stephens Limited. The above is a distillation of that book and any errors in interpretation are regretted and an apology given in advance.